Sports fans of any discernment are concerned with more than just the competition itself; they’re concerned with the setting, the ambience and the overall spectator experience. This is fair enough; after all, if you’re going to go to the trouble to travel any significant distance in order to enjoy professional sports live, then you don’t want to be let down when you finally get there by some crummy venue. There are certain locations that it’s definitely worth visiting at least once…. Those who follow soccer will know that Camp Nou, or Nou Camp, is the home stadium of FC Barcelona. Technically the name translates as “new field”, actually, but we won’t worry ourselves about that. In terms of world rankings, this venue, situated in Barcelona, Spain, is the largest stadium in both Spain and Europe. On the world stage it ranks as number 3 when measured by capacity, which comes in at 99,354. But, of course, size isn’t everything, and the really wonderful thing about Camp Nou is its powerful atmosphere. Sometimes a large venue can seem impersonal, but here the sense of a community is strong, particularly when a fierce battle is being fought on the field. A strange but true fact about Camp Nou is that in 1982 Pope John Paul II celebrated mass here for a congregation of over 121,500 people! 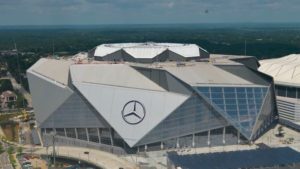 This stadium in Atlanta, Georgia is incredibly impressive. It is one of only five stadiums in the NFL that can boast a retractable roof, and if you’ve ever seen the roof retraction process on this scale you’ll appreciate what an extraordinary feat it really is! Anyone who follows an American football blog will know that this season’s Super Bowl, Super Bowl LIII, is due to be held here in February 2019. The Super Bowl is always a memorable event anyway with the game itself and the spectacular half time show; but, staged in this venue, with a capacity of 71,000 expandable to 83,000, this season’s should really stand out. At the other end of the scale is Wimbledon in the UK. Both a major tennis tournament and a venue, Wimbledon has a long and proud tradition. In fact, it can claim to be the oldest tennis tournament in the world, founded back in 1877. Number 1 Court here has a spectator capacity of just 11, 360 which makes the spectator experience extremely civilized and intimate. The English traditions add to the atmosphere too, the dainty consumption of strawberries and cream being one of the best known, and the absence of background music being a more subtle feature that makes for a dignified calm. 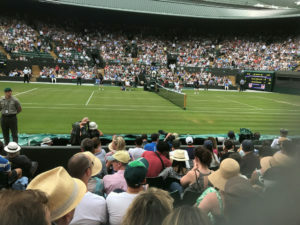 Wimbledon as a whole, both in terms of the venue and the atmosphere of the tournament, makes such a contrast to our big, bold, American style and is well worth attending for the fun of the Englishness alone.